My home is a structure where I sleep, work, bathe and ummm, relieve myself. The watch tells you what time it is. My home has sophisticated systems that keep me warm in the winter, dry when it rains and cool in the summer. The home has fancy devices that I use to store and prepare food. The watch tells you what time it is. From that picture, it must be able to tell you something else with those other dials. I’m too lazy to look up what those dials tell you, but surely those features aren’t worth $176,300 unless they successfully predict the stock market, cure cancer or teleport you Star Trek style. Of course, no one buys this watch because they have to know what time it is. The main purpose is to express to others how much money you have. Can’t afford the $176,300? Good news! It is possible to express yourself for a lot less. 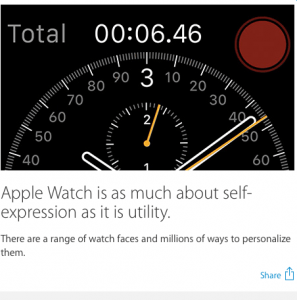 If you haven’t lived under a rock, you know that Apple finally showed the world their newest product, a watch. Apple Watch is as much about self-expression as it is utility. Toilet paper: The softer, the better. Same goes for underwear. Cap’n Crunch cereal: This is a guilty pleasure that is horrible for me, but I can’t quit it. Do they have rehab for this type of thing? Beer: Life is too short to drink crap beer. Door knobs: Actually, I don’t care about door knobs. Still beats fashion though. Cat pictures on facebook: I lied again. I don’t know which is worse, cat pictures on facebook or actual cats*. If I had to choose though, I’d pick cats over fashion. 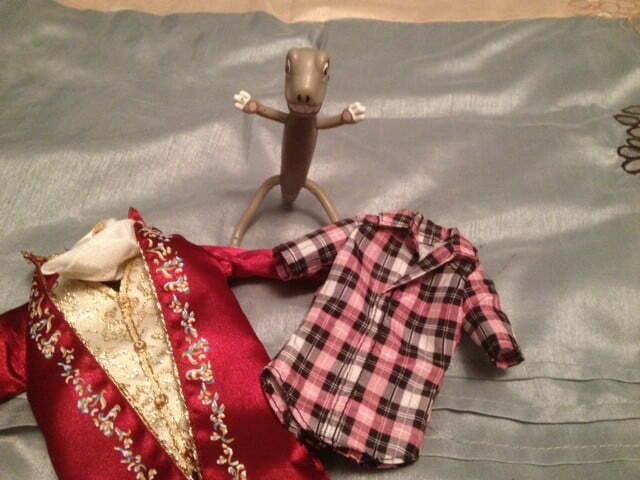 Spendosaurus is a fashion diva, the opposite of me. However, I wasn’t always fashion unconscious. I used to care what people thought. I’d buy t­-shirts with ironic pictures or sayings. “Hey look at me everyone, this shirt is so clever!! !” I’d donate perfectly fine clothes just because I didn’t find them stylish anymore. Now I just don’t care. Mrs. 1500 would argue that I take it too far. There are definitely some clothes in my drawer that should have been moved to the oil-change-rag-bag in the garage a while ago. Perhaps I should send the ones with the worst stains and the biggest holes off to shirt retirement in the garage. Side note: Kind of ironic that this blog is about early retirement, yet I make my shirts still work when they’re 94 in shirt years. Junky clothes are great, I moved 8 tons of rocks this summer while wearing some of those rag-bag clothes. Others on my street pay landscaping companies just to mow their lawn. I can tell that the neighbors think we’re poor. This is just how I like it. White shirt**: Here in Colorado, the sun is intense and hot. White reflects light. White is cool. White is right. (Hey, that even rhymes; I am clever after all!). The white shirt is not without it’s problems. I have a frequent problem delivering food to my mouth, you know, eating. A white shirt + pizza or a burrito is a recipe for disaster and humiliating finger pointing from children. Shorts: I don’t get the dudes who are too cool for shorts. Anything above 70 and the jeans stay in the closet. Beware: Similar to looking at the Sun, staring at my pale, white legs may result in retina damage. If you see me in shorts, please avert your eyes and hold your laughter. I’m sensitive. Black shirt: Remember what I told you about white shirts? Black ones absorb the sun’s rays and keep you a bit warmer. Jeans: Costco has ugly, Kirkland jeans for about $13 and more stylish ones for $20. I have both. The $20 pairs make an appearance on special occasions like a date at Chipotle with Mrs. 1500. Could it be any more black and white? Ha, I crack myself up. Really though, the beauty of this wardrobe is that you never have to think about what you’re going to wear. Buy a pack of white undershirts from Costco and you’re halfway there. I don’t care about watches or new phones or fancy cars or expensive sunglasses. If someone doesn’t want to be friends with me because of the way I dress, oh well. However, if they’re a bit embarrassed when I drop a slice of pizza on myself or knock over a bottle of beer, I’ll give them a pass. *OK, cats aren’t so bad. The issue I have is crazy allergies. If I dare touch a cat, I sneeze nonstop for the next hour. Not fun. Stay away felines. No shoes or white t-shirts, no service! A quick Google search revealed that certain street gangs also wear white shirts. I cringed for a brief moment as I gazed down at the white shirt that I happened to be wearing that very moment. Good news though, I lived to type another day. You and Mr. FW appear to have the same white t-shirt food delivery problem :). Though his incidents are usually related to cooking, so I really can’t complain. We retire Mr. FW’s clothes when the rips (in mission critical areas) are unrepairable. I’ve found that you can stitch holes in jeans, but, they won’t hold forever. Eventually, the material becomes so threadbare it just wears away. P.S. Glad to see Spendosaurus finally got some clothes. have you tried iron-on patches? I use these on the inside of things like jeans when the fabric is starting to get thin and it seems to hold it together longer and hide better than stitching since you can usually find them in a similar color. Good thought. I have indeed used those iron-on patches and they’re awesome for shirts or knee holes, but they don’t hold up well in the, uh, seat area. I think there’s just too much stress on the fabric (especially since the jeans-wearer in question bikes to work in said jeans). P.S. Sorry for populating your comments with my hole problems, Mr. 1500. I had someone sow my jeans and they have been solid for another 3-5 years, can’ t throw the good ones away. Based on this rip in mission critical area and sow back, I’m hoping to show them off when I’m 65, we all have dreams. Spendosaurus is eccentric and despite his taste for high fashion, he usually goes sans clothes. I don’t know what my eating problem is. No matter how hard I try, something bad always happens. I think we’re on the same page in terms of fashion – In high school I wore a plain white t-shirt and jeans at least 3 days per week and even now Mr PoP’s weekend wardrobe is jeans and a dark t-shirt from an old job since they fit so well and he has about 10 of them. Shopping is just too time consuming and not fun. I genuinely need a new pair of flats for work (the sole is separating from the shoe which seems okay for home but not work) and I can’t bring myself to go through DSW and get a new pair. I know, right? Shopping is almost painful for me now. Uggghhh! I always try to come by for the rants. My husband is a white/black shirt and costco jeans guy. For the most part I don’t care but I do admit I laugh a little when he wears plaid short and sandals with socks. I hope you don’t do that. I am all for fashion freedom – but there is a line that can be crossed I think. I’ve always felt that about watches…IT TELLS TIME! Nothing else nothing more. Sure, some people use it as an accessory but spending that much money is just unfathomable. And oh…Cap’n Crunch cereal…man it’s been a long time since I had that…I think I have a craving for that now. Andrew@LivingRichCheaply recently posted…Are You a Sports Fanatic? Stay away from the Cap’n Crunch! It is like a drug. Watches are ridiculous. They were invented so ship captains could tell the time without letting go of that big wooden wheel steering thingy. Now though, watches are a bit silly. My closet is stacked. I don’t really buy clothes anymore because I stay away from malls and stores. But I used to love shopping. Plus, my mom likes to shop for me and she gets me clothes. Most of my clothes are for work. Outside of work, I wear the same athletic wear. Some of my shorts are years old…..
I’m with you on the athletic wear. I love the fancy wicking shirts. I enjoy the white shirt as well, I make it fashionable by going V-neck. If you stick with the thrift you could be wearing Polo Ralph Lauren and Tommy Bahama on the cheap in no time. The watch thing I never really got, I bought one in 8th grade, decided it was a bad idea for me and moved on with my life. Watch free since ?? ?1995 or so, although my Nike fuel is a watch I suppose. I’m all set for Thursday, I might be a few minutes behind, I’m supposed to work till 7, going to try and get out 30 min early, will you be wearing one of your fashionable white t-shirts? Thursday is great. I will have a white t-shirt on and a white Warren Buffett cap. I’ll send you my phone number too. Those stains are minor war injuries and should be looked upon with respect. Virtual fist bump! I laughed out loud at “white is right”. OMG! Now that I’m a virtual employee, I really have leaned into the shorts and t-shirt wardrobe. I get really upset when I have to go somewhere that requires actual shoes, pants, or a collared shirt. Where do these guys get off, with these draconian wardrobe requirements? LOL! I know! I would wear shorts 300 days of the year if I could! Oh don’t get me started on watches. My brother bought a $500 watch and I thought he was crazy. My watch cost me $60 and I’ve had it for 8 years. 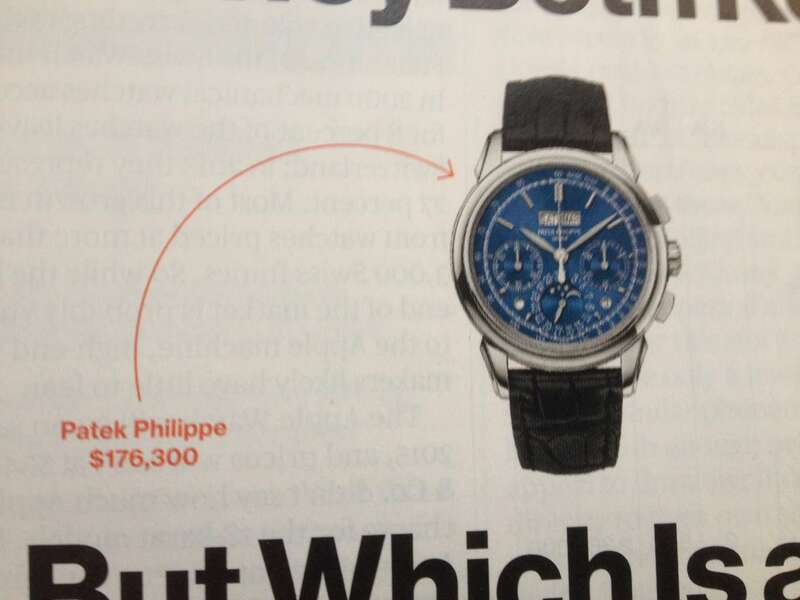 I don’t even want to talk about $176,300 watch. That’s just insane. It is totally insane. I wonder how many they sell per year?!? Steve is definitely the more stylish out of the two of us. It’s not that I don’t care — okay, I kinda don’t care — but I have zero fashion sense. So I’m frequently in jeans/t-shirts. Or sweatpants, as I work at home. That said, I believe all our stuff is brand-name. We just don’t pay retail and we own very small wardrobes — I can’t fathom 47 t-shirts, I don’t think I have that many clothing items total! P.S. It was great seeing you guys in NOLA! Sweatpants are awesome too! They are great to type in when the weather gets chilly. I actually have a lot more than 47 t-shirts. They are just packed away in boxes. Do they have rehab for this type of thing? Dude, my goto fashion is a black v neck tshirt and jeans. 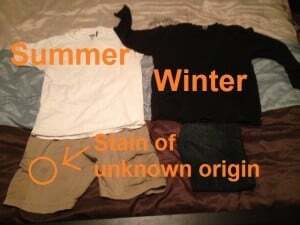 I just got back from 5 days of minivacation/surfing and all I wore the whole time (with rotating underwear of course) was the same black v neck tshirt and jeans. Yep, my fashion is no fashion. Still jealous if your surfing. Google adsense on your sidebar is telling me to goto Sears to get the latest fashion. NO! F U Sears!! Haha Google, Facebook, and the ilk are starting to get creepy good at picking up what’s being typed and thought of and displaying as ads. That watch is ridiculous. For that price, it better cook all my meals, clean, and give me foot massages! I concur with craft beer! anna recently posted…Pregnancy Notes Round 2! You can’t go wrong with jeans and a t-shirt. As for watches, whenever I need to know what time it is, I ask someone… super-social and I never need to worry about the battery running out! 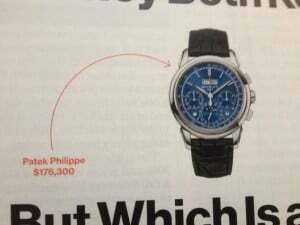 I recently watch shamed my mother because she’s looking at a $33k watch from some fancy smacy place and replied to me that she could get it consignment for a bargain $18k! My stepfather said she should just get a Rolex. I replied that even the bargain watch would be more than twice what I paid for my car. She laughed but later came to her senses – for now! 1500, I love your sense of humor. I am with you on all of the above. CJ has t-shirts that the hem has come loose. “Please don’t wear that to work?” “What? This? I wear a sweatshirt over it all evening!” Thank goodness guitar teachers are supposed to look grungy. All he needs is an earring and some tatts. I have one long, black skirt that I keep for fancy occasions and funerals. I have no dress pants at all. If I need them, I suppose I’ll have to get them. So far, so good. But, like you, I have my limits. If I am ever to lift a crap beer to my lips (I’m looking at you Mr. Bud, Mr. Miller, and all your cheap friends), please let lightning strike me to the ground! Happy weekend to you and all the 1500s! I pretty much loving wearing the same stuff all the time. Well not every day but you know what I mean. Minimalism FTW! He recommends you try one. Just don’t wear these shirts too near a fire – they are more flammable than your regular cotton shirts! Then I realized 1) the guy gets a wardrobe budget that 2) he can write off, and 3) he makes enough money to fly his own plane. (Cool, but still…) Also realized that I wear a watch 4x a year, and it’s a girl’s Timex Ironman for when I go kayaking. Ha! Man, if your first good watch is a Rolex, I fret over what the successors are. The length humans go to impress each other never ceases to amaze me.